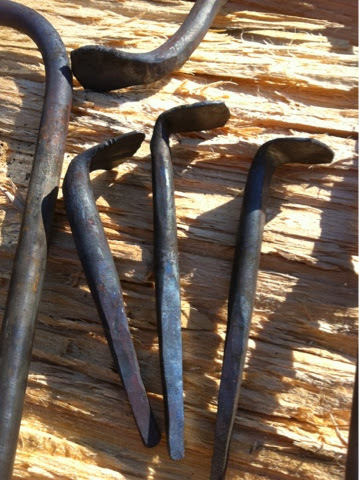 I spent 2 hours this morning at my friend and fellow instructor's blacksmithing shop forging a couple of holdfast and bench hooks. Last year while demonstrating I smacked a cast iron holdfast that then failed. The pad shot off like a bullet and wirred by a child's face! It could have been quite dramatic and harmful to the child so at that moment I vowed to never use cast iron holdfast for demonstrations again. 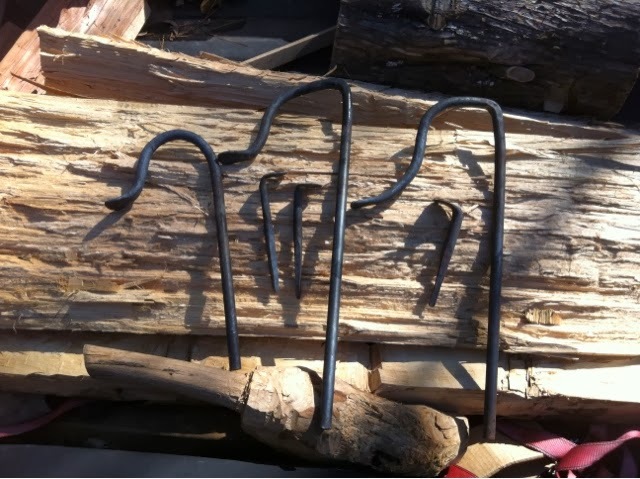 I am a novice-hobby blacksmith, at best, but I was quite surprised at just how easy these bench aids are to make. I made three styles of holdfasts and I will decide which I like best before I commission a professional to whip out a batch of them for the school. I also made a few bench hooks - not the wooden aids to sawing - the iron planing stops as they are sometimes called. The hooks still need some grinding and toothing but I'll do that Sat. All in all the steel cost me $8 from my local steel yard - nevertheless it was still quite the costly endeavor as when I arrived to the forge I was immediately put to work on a leaky sink and I still have to go back and help with the timber framing for his pool house, a reproduction of the early 19th century kitchen at Magnolia Mound Plantation... where else could I go to use a fully equipped blacksmithing shop, though, with such a great teacher looking over my shoulder!? Thanks Karl! On a related note, come out and see me at LSU's Rural Life Museum this Sun, Dec 1st. I will be demonstrating traditional woodworking and building a repro vernacular Louisiana table with hand tools. You can spend the day with 2-3 thousand of your closest friends and perhaps pick up a Christmas gift or two from local artist. I will not have anything for sale myself. 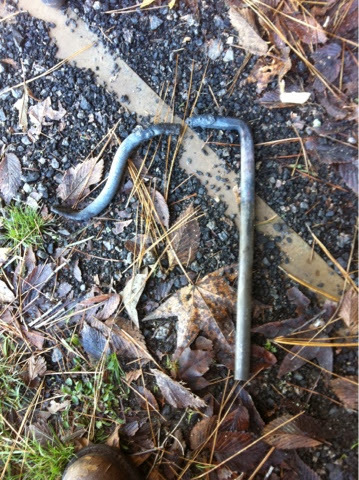 The burned steel holdfast brings to mind one of my first projects. My son and I were making my wife a set of garden markers and I found that, even with the blower shut off between heats, if I had 3 rods in the fire I couldn't work them fast enough to keep one of them from burning up. The old saying "Too many irons in the fire." has meaning for me. I'm a little faster now but I still only work with two irons in the fire.